Welcome to The 2018-2019 School Year Sooners! Starting today at 5PM CST we will reopen the general application to the org for OU students across the Norman, HSC, and Tulsa campuses. After concluding our first school year of infrastructure development we took a small break over the summer to relax and polish some things up. Before we get to how you can get involved let’s recap this year and hear from some of our own leadership and members on what year one was like and what impact it has made on them. Bi-weekly all org meetings to discuss top-level changes, initiatives, and community. Bi-weekly game nights on 4 different titles as we research and build up more. We will incentivize these nights with giveaways as we also ramp up our fundraising. Additional region-wide opportunities for competition and community engagement through two strategic partnerships in the state. Opportunity to be part of our Twitch Partnership and TV station we will detail heavily in September. 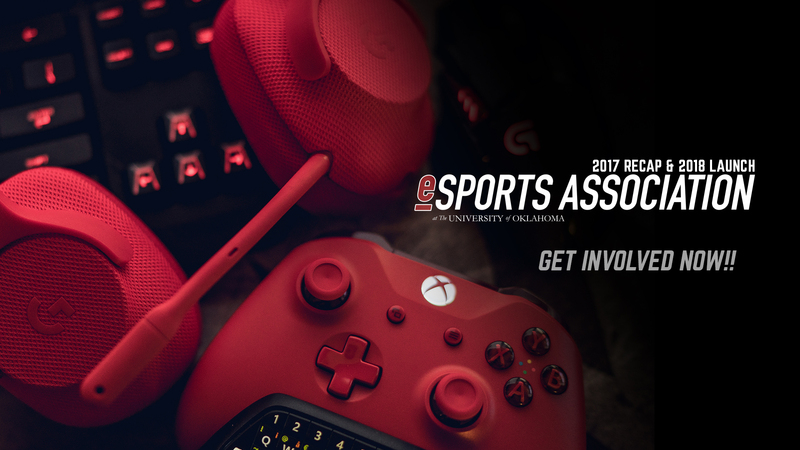 Opportunity to be part of our news and media team hosted here at sooneresports.org to help share awareness, educate the area, and advocate for the things YOU care about most in gaming. Partnerships and networking through major brands we all know and love. Being part of a brand new initiative that is gaining momentum day by day on the path to more and more formalization and opportunity. Philanthropy initiatives with opportunities like OU Big Event, Extra Life, and more. K-12 & At-Risk outreach development starting in the Spring. Wellness is a valued foundation for us and we will create an opportunity for everyone to learn and be part of a balanced curriculum. For those up for the task, intercollegiate competitive opportunities across 4 titles/6 teams currently with scholarship prize pools. Established communities have bi-weekly community game nights that will be incentivized. Additionally, they have intercollegiate competition opportunities. Developing communities have momentum already and have the occasional gathering while we build it up. They may or may not have intercollegiate competition opportunities. Initial research communities come from feedback from our members. We look to see what we can do to cultivate a community around a specific title or topic to elevate it to a consistent programming state. We are constantly open to feedback and exploring new opportunities. There are already more communities in our org than listed here. Well, words are words how about some factual analytics from last year. Before that, we only sent a single mass email to the campus in January. The rest of these numbers were completely from word of mouth and grassroots networking. Share the word! Build a community! This isn’t everything, but these are some of the big items for sure. Development opportunities are specific opportunities for leadership, career development, competition, and practicum. From intercollegiate teams competition, being a streamer, being a writer, leading the above referenced internal communities, or helping manage and evolve the entire development, we are creating a diverse place for casual to business. Here are the current development teams. If you’d like to see a little more about our leadership and some of the additional programming we offer check out our organizational website HERE. We start defining these efforts more in depth soon. More About Us CLICK HERE! *if you are an HSC or Tulsa student please EMAIL: ouesports@ou.edu as we have one additional step to verify your status. We have opted to remain due free for 2018-2019 to continue to build infrastructure and community. OU Student Registration CLICK HERE! We are also enabling our alumni registration application which can be found HERE. Alumni will be granted access to the Discord if you choose and still be a part of our community. Additionally, we will start sending out an email newsletter at the start and end of every semester to keep you on top of our developments. There is no mistaking the research opportunities with this initiative. We would love to have more faculty involved with helping us figure this out more and building advocacy. If you have any interest or questions at all please email ouesports@ou.edu and let’s start a dialogue. All 20 months of development are because of student buy-in and some hyperactive staff advisors. If you think you can contribute to the development of this effort please email ouesports@ou.edu. We are highly selective of staff involvement due to the constantly expanding needs of this development. For those that are not OU students or alumni, we will soon be able to partner directly with you for funding, advocacy, marketing, and much more. If you have an idea or find merit in our developmental efforts do not hesitate to email ouesports@ou.edu and let’s start a conversation now. We are adamant about building a strong community both inside and outside of OU as well as partnering with Oklahoma businesses and communities first and foremost. We will soon have things like ad space on this website as well as on our Twitch TV station to start incentivizing contributions and help bring awareness to our partners in our own backyard. Help us elevate this! Mike "Moog" Aguilar is the Lead Advisor of the Esports Association at OU. He works for OU IT doing project management and business analysis. He is a US Army veteran, has worked for Apple, worked in the public sector, and is a photographer of almost two decades. Mike has been a gamer since the Atari and also currently serves as a committee member for S.E.A.T.